Ansar Beit al-Maqdis promises to 'fight and kill the Jews' after Friday night attack intercepted by Iron Dome defense system. An Egyptian jihadist group said Saturday that it fired a rocket at the Red Sea resort of Eilat which was intercepted by Israeli air defences, its second in a fortnight. Al Qaeda-inspired Ansar Beit al-Maqdis (Partisans of Jerusalem), which is based just across the border from Israel in Egypt's restive Sinai Peninsula, threatened to follow Friday's foiled rocket fire with further attacks. "God helped your brothers in Ansar Beit al-Maqdis to succeed and target the Israeli city of Eilat," the group said in a statement posted on jihadist forums. "Jews, you have to know that nothing will stop us from fighting you, even if the entire world's armies move on your instructions. If they create a barrier between us and you, with God's help and strength, we will get you and kill you." The rocket fired on Friday was destroyed by an Iron Dome air defense battery deployed outside Eilat, an Israeli police spokeswoman said. On January 20, another rocket claimed by the jihadist group struck the outskirts of the Israeli resort city without causing any casualties. In August, a rocket fired on Eilat from Egypt was intercepted by Iron Dome. It was claimed by a Salafist group based in the Gaza Strip, which also borders the Sinai. 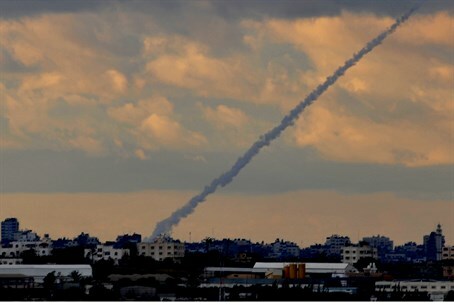 Earlier last week, Gaza-based terrorists fired a rocket at the southern Israeli city of Netivot. The rocket exploded in an open area in the Sdot Negev Regional Council Thursday night, causing no physical injuries or damages. It was the first time since Israel’s counterterrorism Operation Pillar of Defense in 2012 that a Gaza rocket struck near Netivot. The Israeli Air Force responded to Thursday night’s attack by striking several terror-related sites in Gaza. On Saturday, Egyptian military sources claimed to have killed 13 terrorists from Ansar Beit al-Maqdis in an airstrike. The strike came just hours after the rocket attack on Eilat, but was more likely a response to the shooting down of an Egyptian army helicopter on Wednesday by the Islamist group. Five soldiers were killed in that attack, which security analysts said illustrated the kinds of danger Israeli aircraft could face from Palestinian Arab terrorist groups in the event of a withdrawal from the strategically-important Judea-Samaria region. Since the ouster of veteran Egyptian president Hosni Mubarak in February 2011, Israel's border with Sinai has seen multiple security incidents, with terrorists using the lawless peninsula as a launchpad for attacks on the Jewish state. Islamist terrorists stepped up their violent campaign in the aftermath of the ouster of Mubarak's successor, Islamist Mohammed Morsi.